New favorite cheese alert! Mountaineer from Meadow Creek Dairy in southwest Virginia has climbed up and up to the top of my list. Some of my past favorites hit me immediately when they first arrived at the shop, but Mountaineer was playing the long game. I tried it when we got it in about a month ago and thought, oh hey, this is nice. Then about a week after that I revisited it and was like, wow! THIS. IS. SO. GOOD. 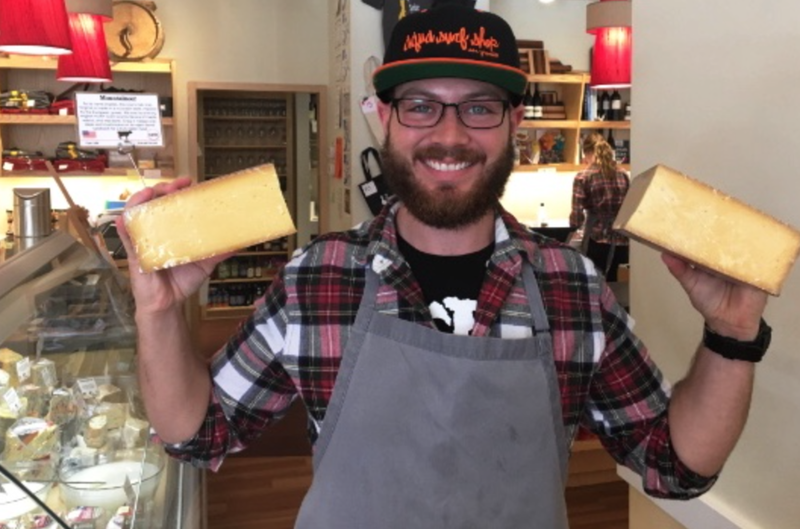 Then this week, Chris (pictured above) exclaimed that this was his current favorite cheese, and I realized hey, it’s my favorite cheese too! Great minds think alike. This cheese is so awesome, and I hope you all become fans, too. It is not a particularly strong cheese, but it has the most satisfying balance of flavors – cashew and whipped cream with an aftertaste of butterscotch, and a silky, melting texture. The Feete family, owners of Meadow Creek Dairy, decided they wanted to make an alpine style cheese after a trip to Europe in 2004. Traditionally, alpine cheeses are made with milk from cows in their summer pastures, high in the Alps. Since Meadow Creek Dairy is located in the mountains of Virginia and they only use the milk from when their cows are out in the pasture, Mountaineer has a decidedly European flair. If I had my eyes closed, I might think it was an unusual version of French Comté. The Feete care deeply about their land, making sure to rotate their cows through pastures to allow the grass to grow and the land to recover. With farmers and cheesemakers who care so much about their cows, land, and cheese, it’s no wonder we are all about the Mountaineer.